A couple of years ago UC Davis enacted a regulation banning smoking from the entire campus. This being California, we don't really have a lot of smokers on campus anyway, but what we are seeing is that the streets adjacent to campus have become little enclaves for the smokers to congregate, such as here on A Street. There is one sat there on the 'naughty step' across the street. 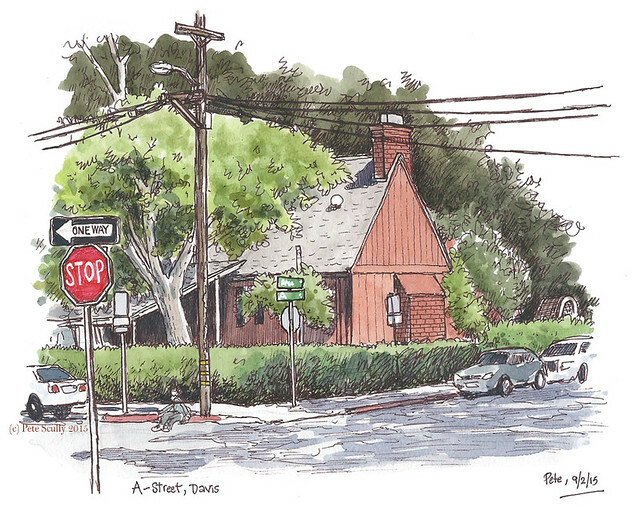 I love this red building, and have sketched it before. It stands out against the very green setting. We've had a very hot and very dry summer here in California, with the air thick from a different type of smoke and ash, courtesy of the huge wildfires we continue to contend with. Now at the end of September things are starting to cool down, if marginally.